The so-called 'long-tail' of research is an important and often underserved community, compared with other areas of science that are well supported by national supercomputing infrastructure. Cloud computing is making it easier to deliver tailored services to these researchers and is enabling new research collaborations across the globe. Accelerating scientific discovery, doing new kinds of research, and providing more efficient services. These are just some of the benefits of using cloud computing, which is now transforming many fields of scientific inquiry. The increasing popularity of cloud computing stems from its ability to provide services that meet the requirements of a much wider range of researchers. The so-called 'long-tail' of research is an important and often underserved community, compared with other areas of science that are well supported by national supercomputing infrastructure. Cloud computing is making it easier to deliver tailored services to these researchers as and when they need them. VENUS-C was one of the first projects to demonstrate the benefits of using cloud computing for research in fields as diverse chemistry, civil engineering, civil protection, biology, astrophysics, and social-media analysis. But this was just the start of a new journey for research leading to exciting developments that have taken center stage at the Cloudscape flagship workshop series since its inception in 2009. Chief among these developments is the European Grid Infrastructure (EGI), which launched its strategy for standards-based federation at Cloudscape IV in 2012. Today, EGI is pioneering the development of an 'open science commons' infrastructure vision in Europe and worldwide, firmly rooted in its federated cloud infrastructure. It achieves this by combining the power of federations with enabling technologies such as virtualization and containers. By capitalizing on emerging business- and service-models, EGI now offers an innovative solution that has a clear value not only to those served by EGI, but also to the diverse range of stakeholders within the federation. “EGI is currently validating its federated cloud infrastructure solution through a use-case engagement program allowing any interested user, from either the public or private sectors, to come forward and give it a test drive with free (but limited) resources for six months in a production environment,” explains Michel Drescher from EGI, who is also a Cloudscape VII program committee member. The success of the EGI Federated Cloud has been overwhelming. It has supported nearly 50 new use cases, with very different resource and infrastructure requirements, since its launch in May 2014. “Gaining this traction amongst different user communities, who require a large number of different models of utilization of e-infrastructure services, would have been impossible without the innovative combination of federation, virtualization, and cloud service models,” says David Wallom, who is associate director for innovation of the Oxford e-Research Centre in the UK and is also a member of the Cloudscape VII program committee. “This approach is also extremely appealing for the supply side worldwide, not just for cloud resource providers but also those additional members of the value-add sectors such as technology/platform providers,” continues Wallom. The EGI Federated Cloud currently has production resources within 21 different resource centers across the EU, with additional global interest from Australia, Canada, Israel, Japan, South Africa, South Korea, and the US. 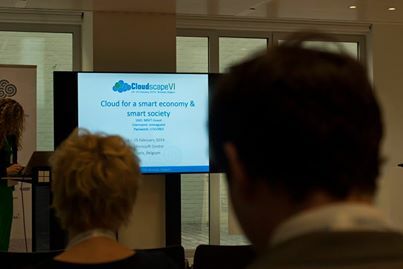 Cloudscape VII, which will take place in Brussels, Belgium, on 9-10 March, also features a spotlight on international cooperation and federated networking, with speakers offering insights into collaboration between Europe, Brazil, and the US. “EUBrazil CloudConnect is a collaborative project 'by design'. All activities have been designed as a natural collaboration between European and Brazilian institutions,” says Ignacio Blanquer from the Valencia University of Technology in Spain. “At Cloudscape VII, I'll be comparing notes on topics of interest with European colleagues as the basis for new cooperative ventures,” says Alan Sill, director of the US National Science Foundation's Cloud and Autonomic Computing Center and a long-standing Cloudscape contributor. Insights focus on two new initiatives funded by the US National Science Foundation: Chameleon and Cloudlab. Complementing efforts from industry, these projects will support a new generation of innovative applications, including real-time and safety-critical applications like those used in medical devices, power grids, and transportation systems. New projects funded under the European Commission's Horizon 2020 program will also be on show at Cloudscape. For example, a lightning talk by David Salomoni of the Italian National Institute of Nuclear Physics's Center for Research and Development into the Field of Information Technologies Applied to High-Energy Physics Experiments (INFN-CNAF) will focus on the INDIGO-DataCloud. The INDIGO-DataCloud project combines the expertise and resources of academic institutions and major companies to develop a new cloud software platform. “The platform will be completely free of charge and open source, operating on both public and private network infrastructures and supporting the needs of researchers from very different disciplines without the need to rewrite the software from scratch each time,” says Salomoni. Other European projects that will be showcased at the event include HARNESS and BEACON. A workshop will also focus on the AppHub non-profit market place, which has been established to increase awareness of open-source technologies that foster federation of resources, services, and know-how, with the overall aim of facilitating open innovation. Find out more about Cloudscape VII here.